I’m overweight. In stereotypical computer nerd fashion, I am pudgy. It’s okay, I said it so you can too. I’ve been overweight for a good while now. Everything I’ve tried to date to get healthier has fallen flat on it’s face. I either gave up after a short period or just didn’t care enough. Last month though I decided that something needed to change. I know I needed to be more active but I could never bring myself to actually be more active. Over the summer I tried to get into running, I actually stuck with it longer than I had anything else over the last 5 years, mostly due to the encouragement of a friend of mine who runs L3 Fitness. It only lasted three whole weeks. I’ve since felt quite guilty about not following through, but I knew that diving back into running routinely wasn’t going to stick. I knew I needed a lifestyle change. One day while perusing Google+, I ran across a blog article written by Louis Gray about the Fitbit. The article talked about how he got the Fitbit tracker and their wifi scale, then proceeded to step and stair his way to a lower weight. Seeing the some of the graphs that you can see on the Fitbit website sold me on the device, but Fitbit was getting ready to release an updated tracker. So I waited. In mid-November I finally ordered myself a new Fitbit One tracker. I clipped it to my jeans and started tracking my steps and floors climbed. I didn’t really do much more than that first couple of weeks. 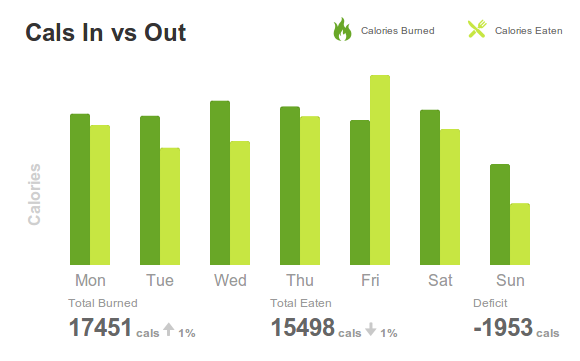 I kind of, in a non-strict way, would log my food into the Fitbit website, but I wasn’t religious about it. Immediately I started noticing trends. First I noticed that I was really not all that active. Sure, I knew this, but seeing it right in front me, in numbers, with no real way to shrug it off was disheartening. One could even say it was a little depressing. Secondly, even with me not religiously logging my food I noticed that I had horrible eating habits. High carbs, high sodium, very little protein. Basically the worse kind of diet that could exist. The reality hit pretty hard. But it put the reality right in front of my face. There was no hiding it anymore. I had to make changes. Good thing was, with this new data in front of me, I knew where I could start. I decided on accomplishing two things to start with. Since the Fitbit helps keep track of how many calories I burn, and I could log how many I take in, I decided that my first step should be to create healthy calorie deficits. I needed to start burning more than I took in. I needed to be doing this daily. I decided that I wouldn’t care if I took in 20 calories less or 500 calories less than I burned for a day, as long as the number of calories burned was more than the calories taken in. I’m doing this in a number of ways. The first is through portion control. Instead of getting the large fries and big burger, I get the junior burger and the small fries. Yes, it’s still greasy food, but it’s less of it, meaning less calories. The second step was when I could control what I ate, I’d eat better food. Yep, I have to start looking at labels. Another thing was to increase my overall protein intake. The solution to this was protein shakes using Syntha-6 protein powder (not weight gain powder, just protein). Add a couple of these a day to bring the total number of meals up to 4 or 5, while ensuring calorie deficits, and I’ve started to see an improvement in my food numbers. Better mix of carbs, fat, and protein. The second thing I needed to do was to get more active. I’ve found that this is a little easier said than done. With that in mind I decided to start small. I would take a single walk a day, and I would ensure it was at least a one mile walk. Simple enough. Walking is less taxing on a person than running is, and it’s pretty easy to accomplish a one mile walk in less than 30 minutes. I needed to start simple. I knew trying to pick up running again would just have me missing a day and feeling bad about it and that would lead to a thinking along the lines of “well, I missed the last one, what does it matter” and that would get me no where. The same thing happens for the walking, but the walk is so easy that it’s harder to have a excuse to not just go walk around the block. Even if I don’t get the full mile, I can easily walk around the block a couple of times. I justify this by thinking that some walking is better than no walking. A strange thing happened though. As I started walking, I watched my step count increase. As I saw my step count get closer to the default step goal Fitbit gives you when you first activate your device, I wanted to take more steps to hit that goal. The result was longer walks. Another result? I added an additional walk after lunch at work. All in an attempt to hit that step count goal. Once I added some of my other Fitbit owning friends to my Fitbit account and could see their steps I saw how even my meager attempts to get more steps was leaving me in last place. And I don’t like losing. What happened? Slightly longer walks and attempting to ensure I had multiple daily walks. With my attempting to reduce my calorie intake, ensuring I burn more calories than I take in, and the addition of light but regular exercising, I’m happy to report that I’ve lost five pounds in one month. Sure it’s a small number, but it’s encouraging because I’m seeing results already. Having my bad eating and lack of activity thrown in my face has forced me to make a conscious effort to be healthier and more active. Eventually I will start running again. I’ve already thought about it. My thoughts are slowly moving from “I need to go walk” to “I need to go run” but I want to walk for a solid month before I add running. But that’s the thing, my brain and body are getting to the point where they want to do these things. I’m not having to force myself to do it. Sure I still miss walks or I have a day where I don’t burn more than I take in. But seeing that in a pretty graph just encourages me to continue. Having a bad day is going to happen, but if my good days greatly outnumber the bad, that will lead to me meeting my weight goals. I’ve lost 5 pounds already, I’ve got at least another 25 to go. Thanks for the L3 shout out, I only wish my fab new website was published (should be ready soon and is much improved). You are practicing what I preach: small changes over time result in sustainable and achievable results while huge overnight changes spell disaster. Congrats on the 5 pounds- don’t discount it because you think it is a small number- it is a great number and you should be proud of your hard work. Keep it up! Woo! So glad to see the Fitbit is working for you. Exciting.